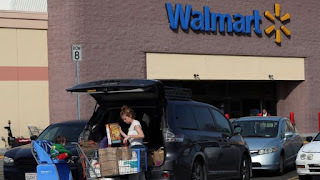 Online sales at the US retail giant Walmart soared 40% in the last three months helping boost overall sales to $128bn (£101bn). Walmart shares jumped 10% ahead of the opening of the New York stock market. President and chief executive Doug McMillion said: "We're leveraging stores and e-commerce to make shopping faster and more convenient." Walmart's UK subsidary Asda, which is merging with Sainsbury's, reported a 0.4% rise in like-for-like sales. That's slower than the 3.4% increase recorded in the first three months of the year which were boosted by Easter sales. Asda boss Roger Burnley said: "Our second quarter performance shows continued momentum for 2018 and this is the first quarter we have outperformed the market since 2014. "We remain focused on... innovation in our own brand, lowering prices and in continuously improving our shopping experience both in store and online."